At Cascade Acupuncture Center, many of our clients have experienced relief from a myriad of symptoms and ailments, including environmental allergies. Moreover, they have experienced relief from reactions to the foods they eat. You probably wonder how much this will cost? One Allergy Elimination session is valued at $48, which is in addition to the cost of the Acupuncture treatment (If billed to insurance: co-pay or co-insurance/deductible or payment at time of service, please ask for our fee schedule. We do offer monthly payments via credit card without additional fees) The Allergy Elimination session is not billable to insurance. One of our clients, with a chronic inflammation of their intestines, is now eating foods which would have caused symptoms in past years and is experiencing 70% less digestive symptoms! Another client reported 80 % improvement in their seasonal allergies, and they were taking 80% less medication, all after just four sessions. Another client had a severe allergy to cats and some dogs for about 20 years. After one session they were able to be around three cats at their daughter’s home without symptoms! Allergy elimination helps our clients get in balance with allergens, subsequently minimizing their allergy symptoms significantly. In some cases, allergy elimination eradicates symptoms entirely. Dr Devi Nambudripad, M.D., D.C., L.Ac., Ph.D. (Acu.) discovered Acupuncture Allergy Elimination Techniques (NAET) in the 1980’s while working with her own food allergies. She and other practitioners have since experimented and expanded upon this rapidly growing technique. Carola Stepper, LAc, RN retired has been trained by Robin Cupp, LAc in Allergy Elimination, Applied Kinesiology (AK) and modified Tapas Acupressure Techniques (TAT). He studied with Dr. Devi Nambudripad and with Tapas Fleming, LAc, who developed TAT, and found that using both of those techniques together allergy clearing results of over 95% could be reached! Our team of Licensed Acupuncturists are trained in Allergy Elimination and we offer this service in our clinics in Hood River and The Dalles. Ideally these sessions are received twice per week or weekly for 5 treatments initially, followed by an evaluation. Each session is 60 to 75 minutes. And initial Medical Intake is required during the first visit. As always in Chinese Medicine we are looking for the imbalances in the body and use tools, techniques and experience to allow the body to rebalance itself. What is involved in an Allergy Elimination Session? Each Allergy Elimination protocol involves four steps. First, we muscle test different vials. They contain water and alcohol and the electromagnetic signature of the allergen, serving as a place holder for the actual substance. They are produced by Ergopathic Resources. These vials are never opened, and our clients only needs to hold them gently. We have 950 different vials available for testing and clearing allergens in each of our clinics. Muscle testing is a biofeedback technique used to gain information directly from the body’s own innate intelligence. Our clients are attempting to resist our practitioners’ gentle pressure on a muscle, for example on an extended arm. If our client is holding a vial with an allergen, they will be unable to resist the practitioner’s gentle pressure, the sign of an allergic imbalance. One study showed a more than 90% agreement between muscle testing food allergies and the standard finger prick-test to determine food allergies. Muscle testing is not without limitations, critics and errors. However, many different practitioners are using it (Chiropractors, Naturopathic Physicians, Nutritionists, Acupuncturists and others) and countless clients have experienced life-changing results with allergy elimination, which carries no risk! Second, we determine which allergen or group of related allergens we clear during the session. For example, we would clear all the different trees our client is allergic to in one session or all the different sugars, but not sugars and trees in one session. Then the vials we are clearing remain in skin contact with these vials for the rest of the session. Percussive massage is applied to the back of our client, while breathing in a specific pattern. Additionally, modified Tapas Acupressure Technique (TAT) can be used to improve the results. This involves holding Acupressure points on the face and head, while speaking positive affirmations. The idea behind this is to harmonize the nervous and meridian system with the allergen, so the body no longer needs to react to it. Third, our clients receive an Acupuncture treatment, while they continue to be in skin contact with the vials which are being cleared. This serves to integrate the changes made during the session on a deep energetic level. This Acupuncture treatment will be focused on the health concerns we deem most important; often it is focused on the treatment of pain. Fourth, our clients avoid the allergen we cleared for the 24 hours after their session. When clearing environmental allergies, the client does the best they can and uses common sense. We like to call this four-step protocol the Mediation session between the allergen and the person’s body. Which Allergies can be addressed? 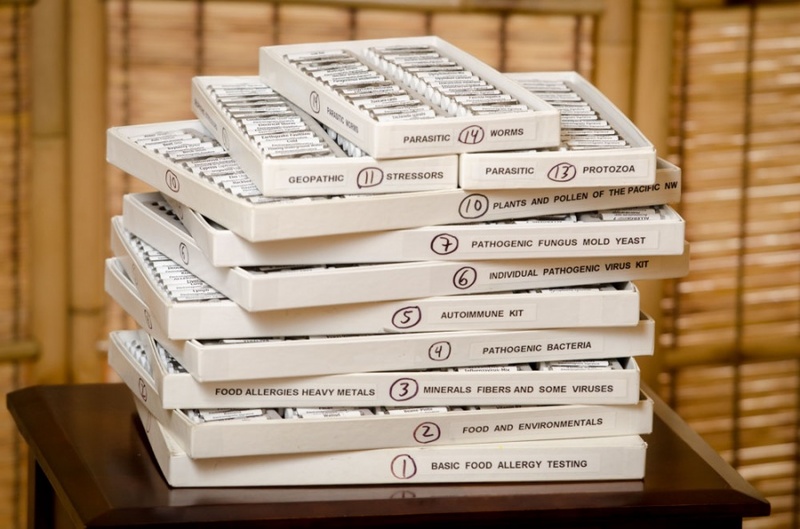 Food Allergies, we can test you for these boxes with test vials: Basic Food Allergy Testing, Food (and Environmentals) Heavy Metals, Minerals, Autoimmune Kit, Parasitic Protozoa, Parasitic Worms, Enzymes – Digestive System, Anatomical/Functional Systems. 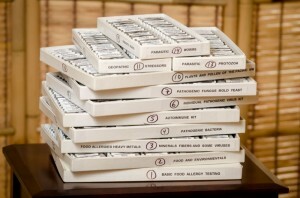 Environmental (seasonal or year around) Allergies, we can test you for these boxes with test vials: (Food and) Environmentals, Heavy Metals, Minerals, Fibers, Plants and Pollen of the Pacific NW, Geopathic Stressors, Household Pesticides and Herbicides, Household Toxic Inhalants, Environmental Toxins, Dust and Fumes. Seasonal allergies are best treated during the non-allergy season! Are There Any Draw Backs to Allergy Elimination? Only one allergen or class of allergens can be addressed during each treatment. For severe allergic reactions several treatments may be necessary. Results for clients who have a weak immune system may be less effective. Worsening of allergy symptoms as part of detoxification for a short period of time can occur, this is called a healing reaction and is a good sign! We are happy to test you for a few vials during your free consultation. Call us today to find out how Allergy Elimination can change your life!